The Ouadi Qadisha (the Holy Valley) and the Forest of the Cedars of God (Horsh Arz el-Rab) is a cultural landscape encompassing one of the most important early Christian monastic settlements in the world. The valley has been a place of meditation and refuge since the earliest years of Christianity. Traditional land-use is practiced in the form of dramatic terraces that grow grain, grapes and olives. The nearby Cedar Forest is seen as a sacred forest. The ca. 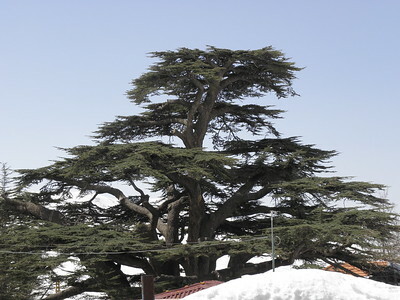 375 Cedrus lebani that survive here are the last remaining of a great forest that gave Lebanon its fame in Antiquity. Some of the trees are claimed to be over 3000 years old. Separate inclusion of the Forest of the Cedars on natural criteria was rejected in 1993, because the designated area was deemed to small for conservation. This is a whole different side of Lebanon, and worth the trek out to the north of Mount Lebanon. I went there on a day tour with Nakhal Tours, a popular and well-organized tour company from Beirut which I had also used for Baalbek/Anjar. There are public buses too, to the town of Bcharré for example, but it would be too much to visit the monasteries and the cedars in one day that way. We first drove up in the mountains, already enjoying fine vistas over the Qadisha Valley and the villages around it with their large churches and redroofed houses. I had seen snow on the mountain tops on my way to the Bekaa Valley too, but here you're much higher (about 2,000 m above sea level). There are ski resorts also. No wonder that the 'Forest of the Cedars' was covered in snow about 1 - 1,5 meter high. The 'Forest' is a pitiful patch of a few hundred trees, leaving some of my fellow tourmates wondering why we had travelled for hours to just see that. It is quite a touristy spot however, the road along the forest is packed with souvenir stalls. There were other tour buses full of Lebanese daytrippers also. After half an hour or so, having photographed every single remaining cedar, we went back into the bus to descend into the valley. This is an exciting ride, as we had a big touringcar bus and the road is very narrow and winding. All around there are cliffs, with lots of small caves in it. Some of those were used by hermits and other refugees. We went to a bigger monastic site: the Monastery of St. Anthony of Kozhaya. Most of the constructions here are relatively recent (pretty nonetheless! ), but it all originated in cave here too. The main cave can be visited, and it is still used by women praying to become pregnant and (after a succesful pregnancy) coming to give thanks by donating pots and pans. Qadisha Valley has gorgeous views and very pretty nature. We arrived via a scenic route, through a mountain pass Bcharee from Bekaa Valley. There is Cedar of Gods cedar tree reserve and some monasteries included in the inscription. Some are only reached on foot via some hikes. 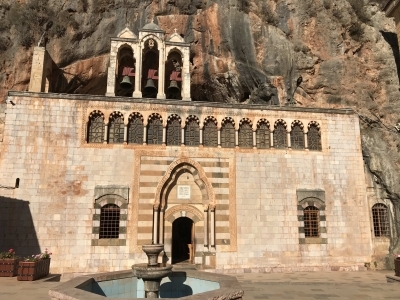 As I am not very keen on those, Ivan took Els' advice from her review and chose the Monastery of St. Anthony of Khozaia which can be reached via car all the way to the entrance gate. Check your maps as the turn from the main road is quite sudden. The monastery has a church that is carved into a cave and a quirky cave shrine all in dark, except for the illuminated statue of the hermit. The views from the monastery are stunning and the monastery very peaceful. We enjoyed it very much. You can spend a day in Qadisha Valley if you wish to, taking numerous hikes, visiting the Deir Mar Elisha - a monastery turned into a museum or the other monasteries. Best way is to have your own car, or you can arrange a day tour from Beirut. I came to The Lebanon ( land of my Father )for my second time in 1994, the first time was in 1989 but I was unable to visit the Holy Cedars because of the war, so in 1994 my cousins Carlos, Kerellos and Carla Keyrouz drove me to the Holy Ceaders. The drive there wes absolutely beautiful but the sight of this magnificent Forrest of God was breath taking, I wish the whole world could see them, I have NEVER forgotton this experience, I pray to God my health will allow me to see them just once more. I have searched for paintings or prints of the Cedars but so far I have not been able to find them, that is why I am on the net now and found your site. "Cedars of Lebanon" was rejected: too small - should look at larger "Cultural Landscape"
Early Printing: The first printing press in the middle east was built in 1610 at the Monastery of Qozhaya in the Kadisha valley. It used Syriac characters. Also this printing press was the first to print in Arabic language. Secret Locations: Early Christian sects fleeing persecution found refuge in the Kadisha. Among these groups were the Jacobites (Syrian Orthodox), Melchites (Greek Orthodox), Nestorians, Armenians, and even Ethiopians. The Maronites, however, are the dominant Christian group in the valley. Ethiopian Orthodox: The hermitage-monastery complexes of Deir es-Salib, Mar Antonios, Mar Semaane, and Mar Assia, along with the isolated chapels of Mar Bohna and Mar Chmouna were all established by Ethiopian Orthodox monks.